PIERRE, S.D. – The South Dakota Department of Transportation is asking motorists to "Move Over" when they approach flashing amber or yellow lights on SDDOT maintenance vehicles that indicate workers are in the area and likely outside their vehicles. Motorists are becoming accustomed to moving over for Highway Patrol, police and other emergency vehicles, but don't always offer the same courtesy to Department of Transportation vehicles displaying the flashing amber or yellow lights. "Crews working alongside the roadway making pothole repairs, shoulder repairs, sign work or even litter pick-up are in a very dangerous situation," says Craig Smith, Mitchell region engineer. "There's not much to protect them from traffic speeding by." The law requires drivers traveling on an interstate or highway with more than two lanes to move over to the farthest lane of traffic when they come upon any stopped vehicle with flashing lights. On two-lane highways, motorists must slow to a speed that is at least 20 miles-per-hour less than the posted speed limit, or slow to 5 miles-per-hour when the speed limit is posted at 20 miles-per-hour, unless otherwise directed. In all cases, motorists should proceed with caution, unless otherwise directed. "This law is intended to protect vehicles stopped on the shoulder of roadway from being hit by passing vehicles," says Smith. "We are more concerned for the people in and outside of those vehicles doing work on or off the roadway to ensure they can safely do their job and go home at the end of the day." 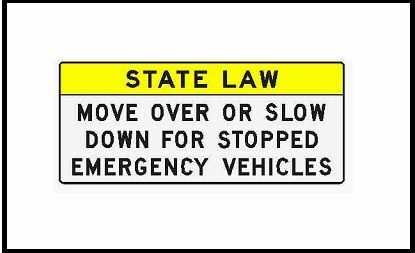 This week, the Mitchell region office is installing additional Move Over – It's the Law signs on Interstate 90 and other highways. You will also see posts on the SDDOT Facebook and Twitter accounts reminding drivers of the law as well. A violation of the Move Over Law is a Class 2 misdemeanor, which is punishable by a fine of $200 and/or 60 days in jail.